Whenever you rent a villa or condo in the Orlando area, in most cases you won't know the exact address until the very last moment, when your plane has already landed and you collect your key. It would be easier if you know the location before collecting the key, so you can check out the surrounding area using Google Maps/Earth or Bing Maps. 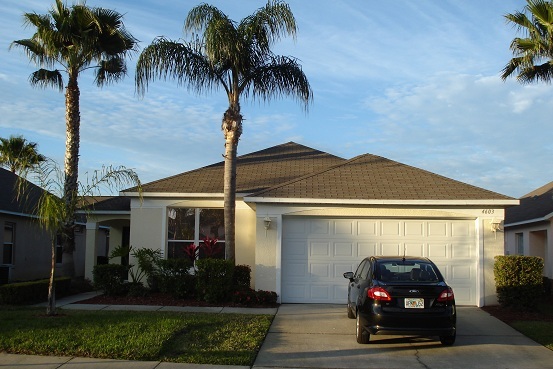 In most cases your rental villa or condo will be somewhere in Kissimmee or Davenport, along the US192 or US27. There are tens of thousands villas and condos in (gated) communities for rent (and for sale), that's why it's hard to say where you will stay if you rent it through a travel agency. Unless you ask for a specific community or rent the accommodation directly from a home owner, you never know where you will stay. Personally, my favorite location to stay in Kissimmee, near the US192 and SR535. It is a busy location with lots of shops and restaurants. Also close to grocery stores like Publix and Walgreens, two Wal-Marts and even Old Town / Fun Spot are a few minutes away. Disney World, Universal and SeaWorld are also short drives. The less time you need to get somewhere, the more time you can spend having fun! The difference between a villa and a condominium is that a villa is more private, the most of them have a swimming pool, and no direct neighbors. So no loud noises from your neighbors at night. Pool heating can take the chill out of the water and is recommended between October and May, but some people prefer to even use it in the summer. Even if you don't choose to use it in the first place, you can always contact the management company to turn it on for you. Ask for prices, before you turn it on. It costs around 150 dollars a week to heat a private pool. Most of the rented condo's have a community pool, which is always heated a little bit. Disney has also got 'villas' at their Disney's Grand Californian Hotel® & Spa, but these look more like condos. If you don't want to book your accommodation through a travel agency, but want to do if yourself, you might want to check out Homeaway and VRBO to contact owners right away. The advantage of using these sites is that you have direct contact with the owners and you can ask them the exact address, so you can plan your holiday even better! Be careful though, some accounts may be hacked, so always try to also communicate by phone with the owner when paying money. People have been handing over money to the wrong person, losing money and still have no key to the home. If you want to be one the safe side and still want to pick your own community where to rent your villa, use Booking.com. If you click on the link, villas are already selected in the Kissimmee area. If you want another type of accommodation, just select it in the left menu on the Booking.com website.